The widowed Irish mother was dragged away from her 10 children in Belfast in 1972. They never heard from her again. The John J. Burns Library occupies a grand neo-Gothic building on the leafy campus of Boston College. With its stone spires and stained glass, it looks very much like a church. The Jesuits who founded the university in 1863 did so to educate the children of poor immigrants who had fled the potato famine in Ireland. As Boston College grew and flourished over the next century and a half, it maintained close ties to the old country. With 250,000 volumes and some 16 million manuscripts, the Burns Library holds the most comprehensive collection of Irish political and cultural artifacts in the United States. The rarest and most valuable objects in the Burns Library are kept in a special enclosure known as the Treasure Room. It is a secure space, exactingly climate-controlled and outfitted with a state-of-the-art fire suppression system. The room is monitored by surveillance cameras and can be accessed only by entering a code on an electronic pad and turning a special key. The key must be signed out. Only a select handful of people can do so. One summer day in 2013, two detectives strode into the Burns Library. They were not Boston detectives. In fact, they had just flown into the country from Belfast, where they worked for the Serious Crime Branch of the Police Service of Northern Ireland. Passing beneath colorful stained-glass windows, they approached the Treasure Room. The detectives had come to collect a series of secret files that for nearly a decade had been stored in the Treasure Room. There were discs containing audio recordings, as well as a series of transcripts. The librarians at Boston College might have saved the detectives a trip by just sending the files to Belfast in the mail. But these recordings contained sensitive and dangerous secrets, and when they took possession of the material, the detectives handled it with the utmost care. The recordings were now officially evidence in a criminal proceeding. The detectives were investigating a murder. Jean McConville was 38 when she disappeared, and she had spent nearly half her life either pregnant or recovering from childbirth. She brought 14 children to term and lost four of them, leaving her with 10 kids who ranged in age from Anne, who was 20, to Billy and Jim, the sweet-eyed twins, who were 6. To bear 10 children, much less care for them, would seem like an impossible feat of endurance. But this was Belfast in 1972, where immense, unruly families were the norm, so Jean McConville wasn’t looking for any prizes, and she didn’t get any. Instead, life dealt her an additional test when her husband, Arthur, died. After a month of grueling illness, he was suddenly gone and she was left alone, a widow with a meager pension but no paying job of her own and all of those children to look after. Demoralized by the magnitude of her predicament, she struggled to maintain an even emotional keel. She stayed at home mostly, leaning on the older kids to wrangle the younger ones, steadying herself, as if from vertigo, with one cigarette after another. Jean reckoned with her misfortune and endeavored to make plans for the future. But the real tragedy of the McConville clan had only just begun. The family had recently moved out of the apartment where Arthur spent his final days and into a slightly larger dwelling in Divis Flats, a dank and hulking public housing complex in West Belfast. It was a cold December and the city was engulfed in darkness by the end of the afternoon. The stove in the new apartment was not hooked up yet, so Jean sent her daughter Helen, who was 15, to a local takeaway restaurant for a bag of fish and chips. While the rest of the family waited for Helen, Jean drew a hot bath. When you have young children, sometimes the only place you can find a moment of privacy is behind a locked bathroom door. Small and pale, with delicate features and dark hair that she wore pulled back from her face, Jean slipped into the water and stayed there. She had just gotten out of the bath, her skin flushed, when somebody knocked on the front door. It was about 7. The children assumed it must be Helen with their dinner. But when they opened the door, a gang of people burst inside. It happened so abruptly that none of the McConville children could say precisely how many they were — it was roughly eight people, but it could have been 10 or 12. There were men and women. Some had balaclavas pulled across their faces; others wore nylon stockings over their heads, which twisted their features into ghoulish masks. At least one of them was carrying a gun. As Jean emerged, pulling on her clothes, surrounded by her frightened children, one of the men said, gruffly, “Put your coat on.” She trembled violently as the intruders tried to pull her out of the apartment. “What’s happening?” she asked, her panic rising. That was when the children went berserk. Michael, who was 11, tried to grab his mother. Billy and Jim threw their arms around her and wailed. The gang tried to calm the children, saying that they would bring Jean back — they just needed to talk to her; she would be gone for only a few hours. Archie, who, at 16, was the oldest child at home, asked if he could accompany his mother wherever she was going, and the members of the gang agreed. Jean put on a tweed overcoat and a head scarf as the younger children were herded into one of the bedrooms. While they were ushering the children away, the intruders spoke to them, offering blunt assurances — and addressing them by name. A couple of the men were not wearing masks, and Michael realized, to his horror, that the people taking his mother away were not strangers. They were his neighbors. 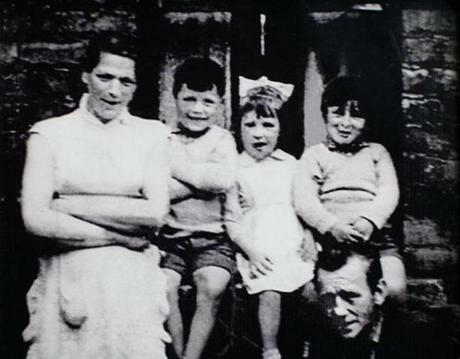 Jean McConville with three of her 10 children. Divis Flats was a nightmare from an Escher drawing, a concrete warren of stairways, passages, and overcrowded apartments. The elevators were perpetually out of order, and Jean was borne by the rough little scrum out of her flat, through a corridor, and down a set of stairs. Normally there were people about at night, even in the wintertime — kids kicking a ball through the hallway or laborers coming home from work. But Archie noticed that the complex seemed eerily vacant, almost as if the area had been cleared. There was nobody to flag down, no neighbor who could sound the alarm. He kept close to his mother, shuffling along, and she clung to him, not wanting to let go. But at the bottom of the stairs, a larger group was waiting, as many as 20 people, casually dressed and masked with balaclavas. Several of them had guns. A blue Volkswagen van sat idling on the curb, and now suddenly one of the men wheeled on Archie, the dull glint of a pistol arcing through the darkness, and pressed the tip of the barrel into his cheek, hissing, “[Expletive] off.” Archie froze. He could feel the cold metal pressing into his skin. He was desperate to protect his mother, but what could he do? He was a boy, outnumbered and unarmed. Reluctantly, he turned and ascended the stairs. The McConville children waited, but Jean never did come back. Not long after her abduction, a young man stopped by the apartment and handed the children her purse and her rings. That’s when Michael, at 11 years old, knew that his mother must be dead. Rumors circulated that she had been taken away and murdered by the Irish Republican Army. But why would they kill a widowed mother of 10, orphaning all of her children? Eventually, the state split the kids apart and distributed them to various orphanages. They grew up, got married, and had children of their own, wondering, all the while, what had happened to their mother. In 1998, the former IRA commander-turned-peacemaker Gerry Adams helped negotiate an end to the sectarian conflict in Northern Ireland known as the Troubles. But the Good Friday Agreement, as the peace deal was known, focused exclusively on the future. The parties could agree to halt the violence, but they could not come to any consensus on how to address the violence of the past. As a result, many wartime atrocities, like the disappearance of Jean McConville, remained unsolved mysteries. One day in 2003, a beachcomber in County Louth, in the Irish Republic, happened upon a set of bones sticking out of the sand. When the authorities arrived, they found a set of human remains, the skull pierced by a single bullet. Three decades after her disappearance, Jean McConville had been found. Her children reburied her, grateful for the chance to give her a Christian burial, and to have a grave that they could visit. But a nagging sense of irresolution persisted: How did she die back in 1972 — and why? Not long after Gerry Adams and his fellow peacemakers hammered out the Good Friday Agreement, administrators at Boston College were looking for a way to mark the end of the three-decade conflict in Northern Ireland. The college appointed a longtime Irish journalist named Ed Moloney to run a unique project: BC would compile an oral history archive of the reminiscences of combatants who fought on the frontlines of the conflict. Moloney, who had impeccable sources in both the Republican and Loyalist communities, warned that the only way such an undertaking could succeed would be if it was carried out in secret. Former paramilitaries adhered to a strict code of silence when it came to their activities during the Troubles, so the only way to persuade them to share this valuable history would be to assure them that their testimony would be kept under lock and key and only released after their deaths. One academic associated with the project talked about “laying down the tapes,” as if they were bottles of old claret, for the benefit of scholars years, or even decades, in the future. The archive, which became known as the Belfast Project, would be based at the Burns Library, on the Chestnut Hill campus. For the next several years, two interviewers crisscrossed Ireland, conducting clandestine interviews. Moloney had selected the interviewers for their specific bona fides. For the Loyalist interviews, he chose a young man named Wilson McArthur, who had good connections in Loyalist circles. For the Republican interviews, he picked Anthony McIntyre, a burly ex-IRA man who had served nearly 20 years in prison for murder, then, upon his release, earned a PhD. Because McIntyre knew the people he was interviewing — because he had served alongside them in the IRA, done operations with them, gone to prison with them — they trusted him, and were prepared to divulge the darkest secrets of their paramilitary careers. He would meet each interview subject multiple times, often compiling 10 or more hours of tape. Once he had finished interviewing someone, he sent their materials to Boston College, so that they could be stored securely in the Treasure Room. The cloak-and-dagger nature of the project was so pronounced that McIntyre and Moloney corresponded about the interviews on encrypted e-mail. 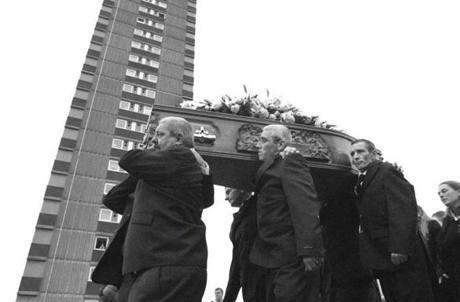 Pallbearers carry Jean McConville’s coffin past the Divis Towers. In 2010, the existence of the Belfast Project was revealed: After two of the participants in the project died, Ed Moloney published a book incorporating their interviews, called Voices From the Grave. A Belfast tabloid revealed that another participant, a former IRA gunwoman named Dolours Price, who was suffering from alcoholism and post-traumatic stress disorder, had entrusted “taped confessions” to BC (which, in a reflection of how far away Belfast is from Boston, the article erroneously referred to as “Boston University”). As it turned out, some of the participants in the oral history project had told Anthony McIntyre, on tape, about the awful fate of Jean McConville. All these decades later, the answers to the questions that had so haunted McConville’s children appeared to lie in the secret archive in the Treasure Room at the Burns Library in Chestnut Hill. Suddenly, the academic project that Moloney, McIntyre, and their colleagues at BC had undertaken was reclassified — as the subject of a criminal investigation. Over the ensuing years, the archive became the subject of an international legal battle, as Moloney and McIntyre fought to honor their commitment to the ex-paramilitary participants and prevent the interviews from being turned over. But the US Justice Department argued that there is no legal protection for people who confess their involvement in political murder and then want to seal the accounts until their death — and ultimately, the courts agreed. One reason that the Belfast Project became such a debacle was that the faculty at Boston College opted not to take up the fight: the archive had been such a closely guarded secret that almost nobody on campus knew about its existence until the publication of Moloney’s book, and when the authorities tried to get their hands on the recordings and transcripts, some scholars sniffed that sending an ex-militant like Anthony McIntyre to go out and interview his friends was not exactly kosher, when it came to the academic norms of oral history. When the BC history department issued a statement about the legal fight, it was not to join with Moloney and McIntyre in solidarity, but to make clear that the department had nothing to do with the project. In Northern Ireland, the secrets of the archive proved to be explosive. According to several people who took part in the project, Jean McConville was murdered because the IRA believed that she was passing secrets to the British Army — a claim her grown children fiercely deny. But even more incendiary was the claim, made by more than one person who was familiar with the McConville killing, that the individual who ordered that war crime — giving instructions that the mother of 10 should be executed and then disappeared — was none other than the architect of the peace process, Gerry Adams. Adams had become a successful politician in Ireland, and an iconic figure on the international stage. But in spring 2014, he was arrested by police in Northern Ireland and questioned for several days about his alleged role in ordering the murder of Jean McConville. Adams was eventually released, and has never been charged in the crime, and he has long insisted, not very convincingly, that he was never in the IRA. But the ironic legacy of the secret archive at Boston College is that Adams’s name will forever be linked with one of the most notorious atrocities of the conflict he helped to end.